Isn't this funny? 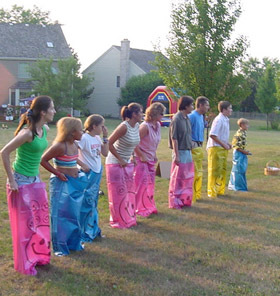 A group of adults & kids doing a potato sack race! 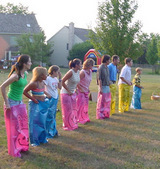 This is a traditional out-door game, and my husband was eager to participate. Well, he did fairly well after all, coming in 5th, and not falling down! The winner was 11 year-old Luke. Even after falling twice, he was able to beat everyone. How did I do in the potato sack race? Although we didn't get to do much traveling this summer, it's always easy to enjoy the warm days. We'll have only a few of those warm days left before fall settles in!